Welcome to another new challenge over at the Glitter 'n' Sparkle Challenge Blog. So a great chance to show off all your makes without any theme to have to stick to! We want to see all of your amazing creations. Our amazing sponsor this week is Spellbindng Stamps who are offering as a prize 3 images. For my card I chose this beautiful fairy image - Cadence. 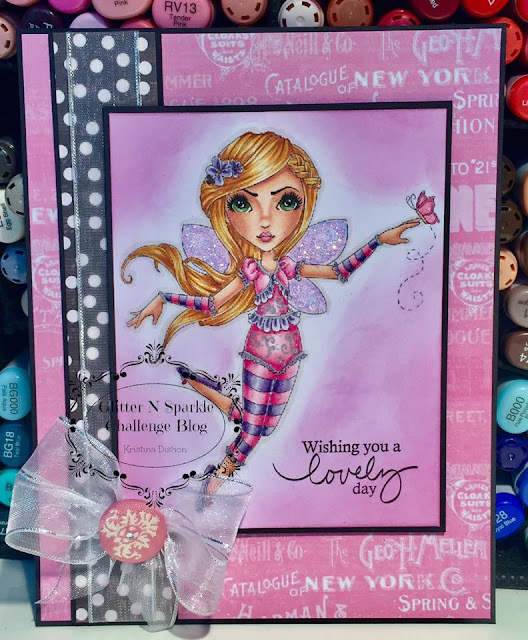 She is coloured with copic markers and off course some glittery diamond stickles have been added to her wings - can't have a fairy without sparkle! I have teamed the image up with some patterned paper from my stash in keeping with the pink theme and topped it off with some ribbon and a beautiful fabric covered brad button - love it when you find the perfect little embellishment in your stash. The sentiment I have used is from Papertrey Ink - Signature Series: Butterfly. Ai Kristina, this is such a fab card. Love the colors you've used.